OK. This is not quite a festival in the sense that I’ve been posting them. It’s more a season. Steve Lawrence and Eydie Gorme were not at any of the other festivals I’ve blogged about so far. Not surprisingly, they will not be at any of the remaining 16 I will cover. The prices were pricey considering the fact that only one or two acts were on a single night’s bill. I attended an August 24, 1968 event at this venue. 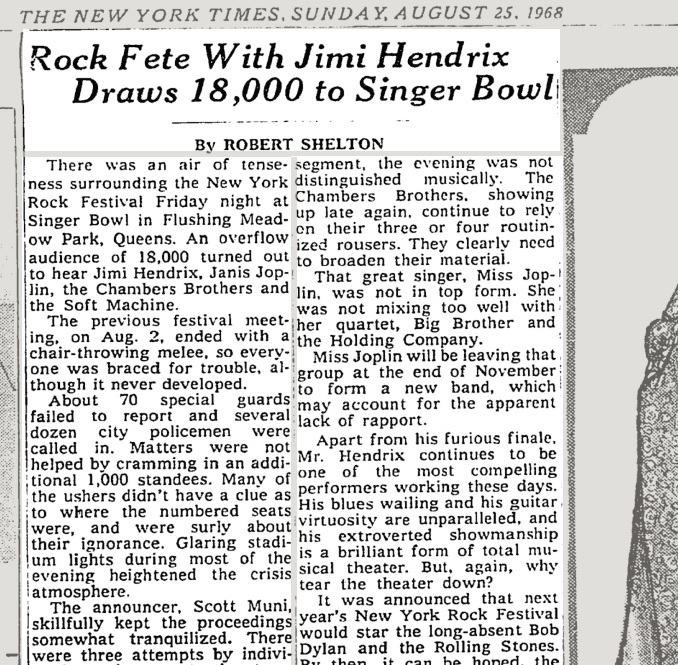 It was a strong bill: Soft Machine, Chambers Brothers, Janis Joplin, and Jimi Hendrix. The stage was in the middle and rotated so we all could see. The stage rotated so we all couldn’t see. It followed a Doors concert that got out of hand. I wonder whether Woodstock Ventures had that in mind when making up its wish list? Jim Morrison seemed to relish antagonizing and pushing buttons. 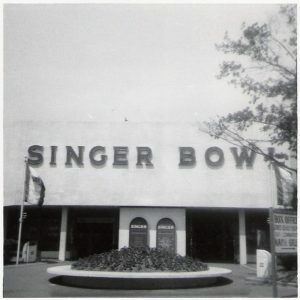 The Singer Bowl hosted the Forest Hills Music Festival. 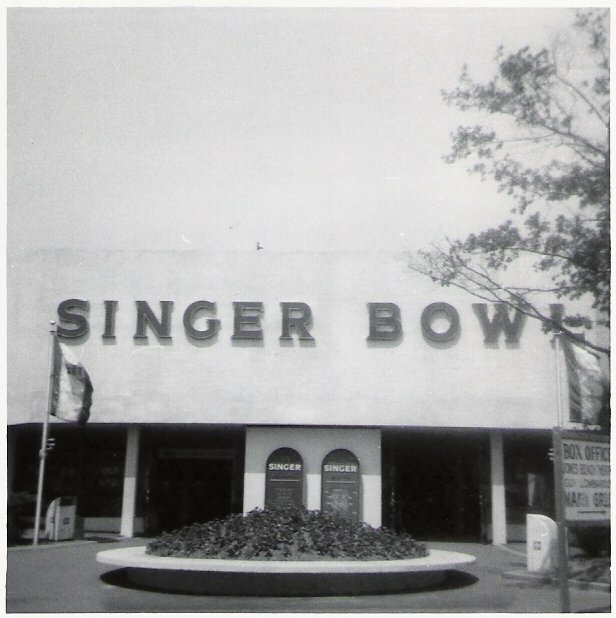 The Singer Bowl was part of the 1964 New York Worlds Fair. Ken Kesey and the Merry Pranksters on their Furthur bus trip famously visited it. The Bowl hosted Fair-related events and after the Fair ended it hosted other events such as Olympic trials, religious events, prize fights, and concerts. At a point, the US Tennis Authority took over the site for its annual US Open Tournament. Today, greatly expanded and upgraded, the USTA continues to use the site for that purpose as well as providing tennis courts for the city’s youth. So. Was this series a festival? That question is like asking, What was a hippie? Since so many Woodstock performers would be there (Janis, Richie, Johnny, & BS & T) I am going to lean toward answering that question affirmatively. Or simply with an asterisk after it on the list. 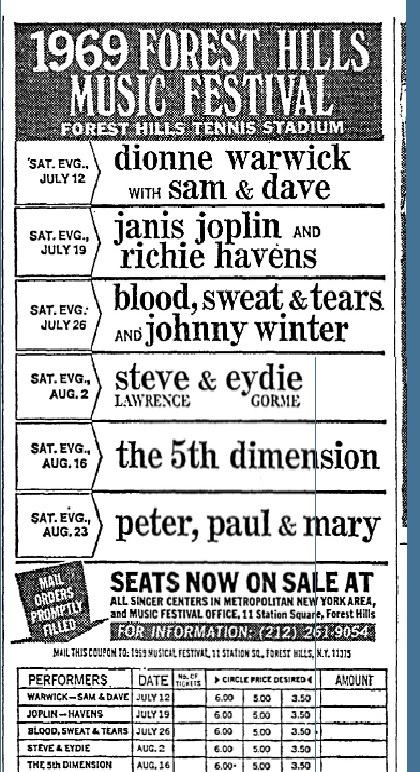 On July 26, Blood, Sweat and Tears and the ubiquitous Johnny Winter played.